Chamonix’s reputation attracts countless advanced skiers from throughout the world. Its dramatic setting, dominated by l’Aiguille du Midi (3482m) is just a few km from Switzerland, while the 11.6km Tunnel du Mont-Blanc offers rapid access to Courmayeur in Italy’s Aosta Valley. Road access from the UK is straightforward via Geneva, with a non-autoroute option from Lyon via Chambéry Savoie Mont Blanc and Albertville. Skiing to suit all levels but do your homework on where is best for you. Mixed ability/activity groups will find plenty to entertain everybody. Aproach from Lyon, Geneva, etc., and the first area you’ll encounter is Les Houches. 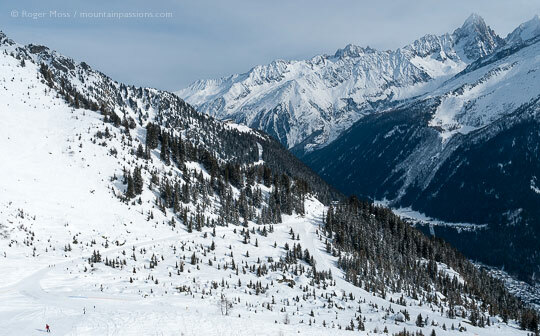 Hugely underrated, it offers lots of intermediate terrain, including some surprisingly long drops through the tree line, both back to the village and above neighbouring Saint-Gervais. Then there’s the legendary Kandahar World Cup Grand Slalom descent. Beginners aren’t forgotten, however. Les Planards (S of the village centre) and Le Savoy (just to the N., with a draglift to the Brévent gondola lift) are safe, dedicated debutant areas. 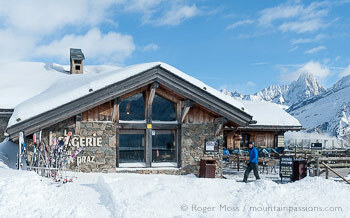 Next along the valley is the cable car serving the Flégère area (1877m), with an onward chairlift to 2525m. There’s also a cable car link to Le Brévent – useful when high winds have closed the Flégère cable car. The combined terrain is mostly red- and blue-graded, although there are a couple of greens. Around 6km further on lies Argentière, whose new gondola lift provides a first-stage haul up to 2138m. Transfer to a cable-car and you'll be transported to 3275m to explore the world-famous (mostly ungroomed) Grands Montets area. The scenery is sensational and the terrain is graded red or black, so it’s strictly for advanced skiers or confident, experienced intermediates. If you don’t feel up to it there are some blues at Plan Joran plus an enjoyable (if occasionally icy) red back to the village. Opening in Dec 2018, a new 6-seater chairlift "Tabé" will replace two former lifts and transport over 3000 skiers per hour up to the mid-station at Lognan (1900m). 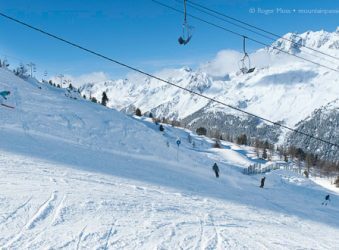 Here, Grand Montets have addressed the notable lack of beginners' slopes with the development of a new area which includes two drag–lifts and snow cannons. Just beyond Argentière a right-hand fork is signed to Le Tour (1462m). Beside the village is a gentle beginner area (La Vormaine), while the Charamillon gondola will drop you 1850m. An onward chairlift heads up to the blue- and red-graded pistes of Les Autannes (2195m). One of the Blue links (Le Col) passes the Plan des Reines chairlift, which will haul you to Tête de Balme (2250m). 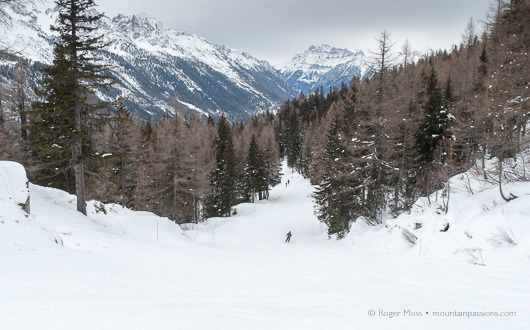 From here a red-graded zig-zag through the tree-line (or a nearby gondola descent) drops in on Vallorcine. 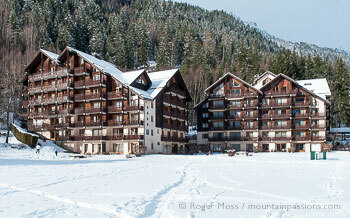 The Chamonix valley’s final ski area is also the most recently developed, with lots of new skier accommodation. While its own gondola-served ski terrain is effectively return runs, onward lifts offer speedy access to many more between Tête de Balme and Le Tour. To sum up: It all sounds spread out and it is, but getting around the valley is easier than you might imagine, thanks to efficient shuttle buses and a perfectly viable rail option — those staying in the valley are offered a Carte d’Hôte giving free travel on buses and trains. The small ski resort of Argentière is situated in the heart of the Chamonix Valley. Expert skiers come here for its off-piste skiing on Les Grand Montets. Skiers based in Chamonix can access the slopes via the free shuttle bus. Traditional, upmarket skiing experience with a range of premium services though plenty to entertain more modest budgets. Great skiing plus colourful, retro-chic architecture in a timeless upmarket winter sports town with thermal spa. Scenic skiing for intermediates at the upper reaches of the Chamonix Valley. Modern skiing was born in the Chamonix Valley, and now it’s world famous among serious skiers - find out why. With its dramatic setting, the glitz and glamour, Chamonix is like nowhere else. The other Chamonix Valley villages all have something to offer but stay in Chamonix at least once. Once a humble farming community, Chamonix is today a medium-sized town, yet somehow the village feel lives on in the predominantly locally-owned businesses. Big-brand boutiques are there too (along with a slightly incongruous casino), but there’s also a tangible pride in being a part of this remarkable place. Chamonix is like nowhere else. As it edges ever further upmarket property values climb relentlessly, thanks to an international reputation and an incomparable setting among some of the most dramatic scenery the Alps have to offer. Despite the glitz and glamour Chamonix remains above all the spiritual home of mountain activities with something for everyone, at all levels and whatever the season. Les Houches has its own chalet-style charm, steadily-growing accommodation but limited dining-out potential (so you’ll end up heading into Chamonix). Beyond “Cham”, rubbing shoulders with the Golf Club de Chamonix is Les Praz, with a pleasing village feel and access to the mountain via the Flégère cable car. 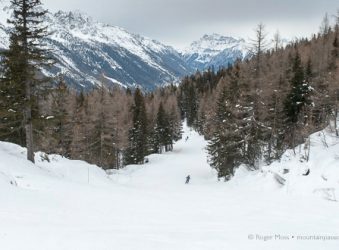 Further up the valley, Argentière has a friendly, self-contained vibe which has many aficionados, particularly among advanced skiers. Le Tour is predictably slightly more remote-feeling, but preserves a pleasingly down-to-earth Savoyard identity. Much the same can be said for Vallorcine, which despite the volume of recently-added apartment accommodation, remains a year-round working community. Why go skiing in Chamonix ? Chamonix is infectiously cosmopolitan and attracts skiers from throughout the world, keen to ski in the birthplace of winter sports. You can ski (or shop) to your heart’s content here, although if you’re really going to get the best from the lift pass you’ll need to be a confident all-mountain skier. Locals will tell you that it’s not overly demanding, but piste grading here can sometimes be optimistic, some blues having red-style challenges. Chances are you’ll return a better skier. That said, there are some super-gentle debutant areas, and at the other end of the scale, endless off-piste opportunities. Boarder cross, speed-riding and Mont-Blanc legend family area at Flegere, Big Air Bag at Brevent. Red, blue and green pistes starting a few minutes from the town centre. Ski Pass gives entry to ice-skating or swimming pool. 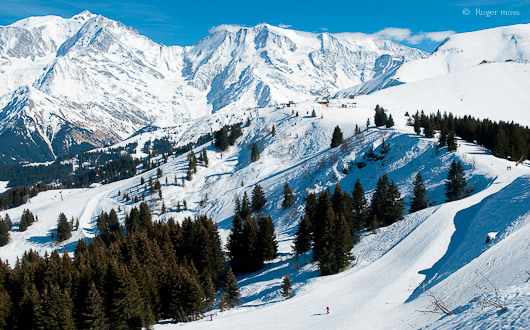 Les Houches is a popular destination for Handiski, with wide slopes and relatively quiet pistes. One of the first schools to teach Handiski, ESF Les Houches offers lessons for any age and disability, in partnership with the Loisir Assis Evasion association. 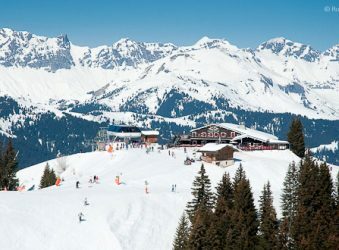 Chamonet.com offers guides for lift access etc. ESF Chamonix extends a warm welcome and has a full range of equipment plus specialist instructors. Chamonix town centre is mostly pedestrianised. The Mulet shuttle bus, ski buses and trains are wheelchair accessible. No-limits skiing for those with the skills and the nerve. Free wi-fi access at key locations. There are lots of other activities and sites to visit. 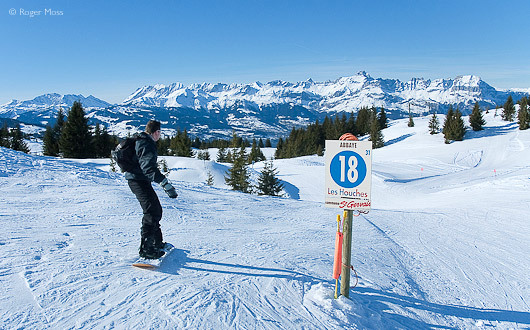 Dedicated beginner areas close to the town centre, plus a safe freestyle area at La Vormaine. Skiing to suit all levels but do your homework on which area will suit you best before you book. Easy transfers from Geneva airport or TGV high-speed rail connection into Saint-Gervais Le Fayet, then Mont-Blanc Express. Chamonix itself is a premium destination, with premium prices. 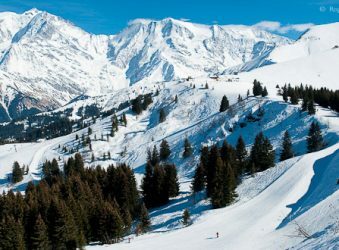 Although well-connected, the valley covers a large area and most ski areas are not linked, something to bear in mind when choosing your accommodation. Chamonix is susceptible to high winds and subsequent lift closures. Ski buses can get overcrowded at peak times of the day. You'll find free parking in the Planards car park, near the Montenvers Tramway station. Use your Carte d’Hôtes (available from your accommodation provider) to enjoy excellent free public transport to access ski areas throughout the Chamonix Valley. Check there’s a convenient bus stop near your accommodation. Visit the Tourist Office to get information about events, guides, places to visit and transport timetables. Buy the right Chamonix ski pass for you - there's a useful guide to all lift passes and what they include on Chamonet.com Buy online to avoid the queues. Les Balcons du Savoy occupy a commanding position 5-10 minutes walk from the north of Chamonix town centre. 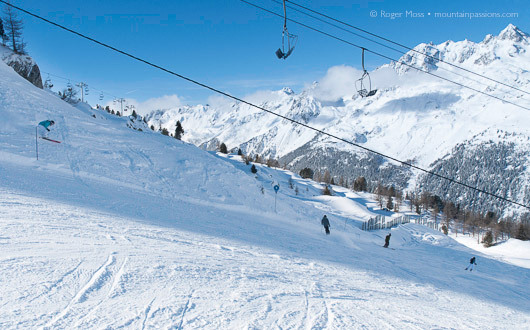 There are nursery slopes very close to the residence with drag-lift access to the Brévent gondola lift. Given the right conditions, there’s doorstep skiing. Nearby bus stops (short uphill walk back to the residence) bring access any part of the valley skiing without driving. 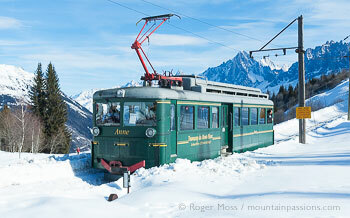 We stayed in a one-bedroom apartment with a panoramic view across Chamonix to the Aiguille du Midi. and balcony. There’s a separate kitchen with microwave, hob and dishwasher plus adequate pans and crockery. The lounge has a sofa bed, TV (English channels available) and DVD player, plus access onto a balcony equipped with table & chairs. There’s a separate WC and bathroom with bath and overhead shower. Free WiFi access throughout the residence. If you wish you can order a buffet breakfast, served in the bar next to reception, cost 12€ per person/8€ child. Massage and beauty treatments plus hammam are available in the spa & pool area. It’s a 5 minute walk to a supermarket, and there’s an excellent boulangerie a couple of minutes’ walk away. Underground parking has lift access to all apartment levels. 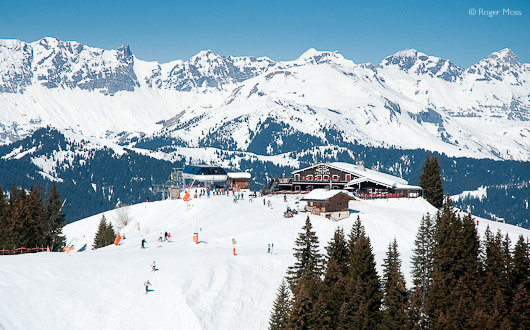 Experience the true meaning of a luxury all-inclusive ski holiday with . Stay in the Club Med at Chamonix and you'll get a package that incudes skiing and snowboarding lessons, a lift pass, plus a wide range of food served throughout the day, as well as Kid’s Clubs, evening activities and more. Ride the world's greatest cable-car – a sensational two-stage haul all the way up to 3842m. Then step out into a different world, and gain a healthy respect for the people who work on the high mountain. 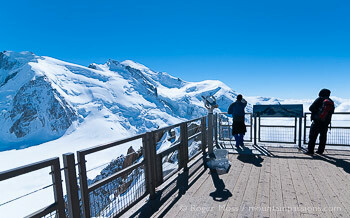 In winter or summer you’ll gaze in awe at the snow-covered summit of nearby Mont-Blanc. There’s also a panoramic bar/restaurant, souvenir shop and displays of archive photographs celebrating the lift. This classic rack railway begins beside the Gare SNCF de Chamonix and winds its way up to the celebrated Mer de Glace, where you can view the glacier and even walk down to an ice-cave under it. These days getting down requires a gondola lift descent, followed by 430 steps down a series of steel stairways fixed to the rocks. It's an adventure, after which you can browse for souvenirs, revive your energy levels with drinks and snacks or enjoy a restaurant meal while awaiting the return train. Ride this historic tramway (France’s highest mountain railway) from Le Fayet or Saint Gervais up to the Col de Voza and 1794m Bellevue in the heart of the Les Houches ski area. Choose a clear day (check the webcams) to enjoy fabulous views. 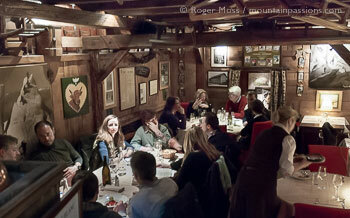 For once the ‘authentic Alpine style’ description has real meaning — this renowned restaurant has been owned by the same family since it opened in 1946. The food and the service are exemplary, and the cosy decor features a museum-like collection of Alpine ephemera from a bygone age. We loved it. Great atmosphere, superb service and award-winning pizzas at this authentic Italian restaurant (they have an excellent Italian deli next door which is worth a visit). Reserve a table, as the restaurant is deservedly very popular. The restaurant offers a snack bar or restaurant with a fabulous terrace offering some of the best panoramic views over the valley. We’ve been there winter and summer and it’s truly spectacular on a clear day. 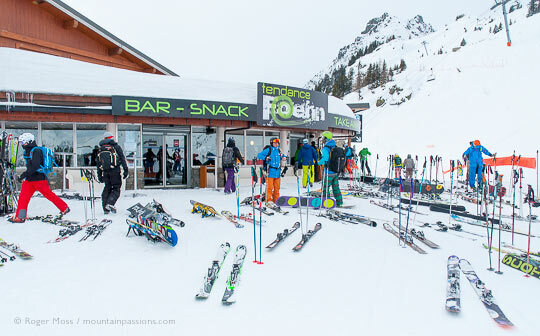 Accessible from the mid-stage of the Brevent gondola at Planpraz, it’s also an attractive lunch option for non-skiers who can get a return gondola ride and lunch for 32€. For a pause from skiing go to Le Comptoir on the lower floor – espresso coffee 2€, and sandwiches & snacks from around 5€. Restaurant meals including local specialities cooked over a wood fire are served in a cosy dining room on the upper floor. From the A40 Autoroute Blanche signs to Chamonix. You'll need chains or winter tyres especially if you are heading beyond Chamonix in the direction of Argentière and Vallorcine. The nearest airport is Geneva (88km) which can be accessed by bus or taxi. 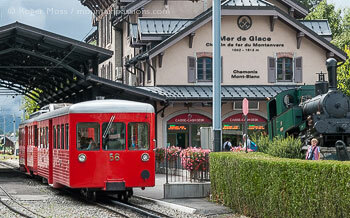 See SAT MONT BLANC which provide links between Geneva and Chamonix. This couldn't be easier - travel by TGV direct from Paris to Saint Gervais, then change to the Mont-Blanc Express for stations throughout the Chamonix Valley to Martigny, just over the Swiss border. 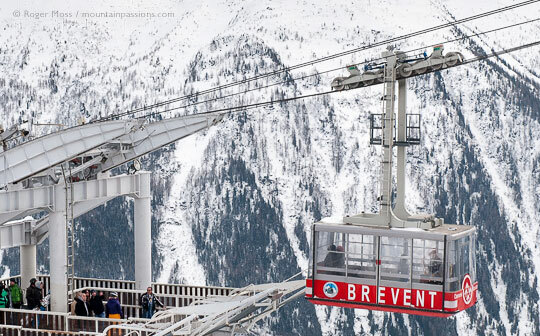 Today we’re setting off to ski the Brévent area, the closest high-altitude skiing to our apartment and to Chamonix itself, being located just above the town and accessible via the powerful 8/10-seater Planpraz gondola lift. The last time we were here things were very different, with a memorably hairy ride up in old, cramped ‘egg’-style cabins, but back in 2009 the whole installation was upgraded. It’s still an impressively steep haul, though, but faster and much smoother, after which we step out onto the mostly south-facing terrain at Plan Praz (1999m). From here advanced skiers can take a vertiginous cable-car ride up to Le Brévent (2525m) for sensational views of the Aiguille du Midi and the massif du Mont-Blanc, plus a single black-graded scenic descent made even more interesting by having two of its intermediate sections dividing briefly into alternative routes. They reunite before joining either a green piste back to Plan Praz or an onward blue over to the Cornu sector. Snow permitting, you can then ski a black (Nants) all the way back to the floor of the valley or the base of the Planpraz gondola. For now we decide to pass on Le Brévent’s black terrain and instead explore some of the intermediate runs before the imminent arrival of this morning’s Sunday skiers. Thanks to the previous night’s copious snowfalls we float off silently on fresh powder, and lay tracks on Vioz and Blanchots, two blues which drop us neatly at the base of the Cornu chairlift (1814m). The high-speed six-seater serves three steep Red pistes, with the option of a detour on an even steeper Black (Bouquetins). For countless skiers this celebrated descent would alone more than justify a long-haul visit to Chamonix. But as you’d expect, it’s not for the faint-hearted, since access from the Aiguille du Midi involves skiers being roped together to edge their way down a nerve-janglingly narrow arête with the kind of sheer drop it’s best not to dwell upon. Once safely down you’re off on an epic 20km off-piste descent (with around 2700m of vertical) which you’ll still be describing to your grandchildren. The presence of crevasses means that this is one descent for which you’ll need to be accompanied by a qualified local high-mountain guide. 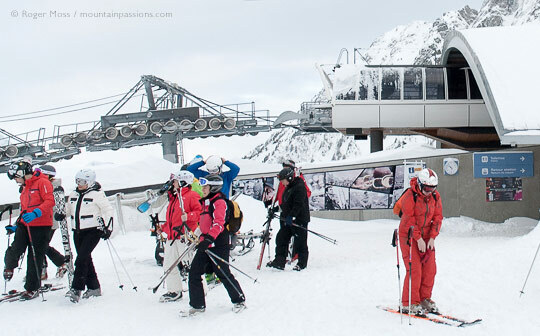 The end-point is where the glacier ends, below the top station of the Montenvers Tramway, which you’ll reach by climbing a series of steel stairways and riding a gondola lift. After enjoying overviews of skiers tackling with varying degrees of success the more demanding descents found up here, we reach the 2333m top station and opt for the red-graded Charlanon. After a brief schuss we make a tight right-hand turn, which fires us down onto an unexpected and impressively-steep wall. In Chamonix it really does pay to expect the unexpected, a thought we ponder while powering our way down the sharp drop which eventually eases before passing the arrival points of a couple of chairlifts. A final tight left turn, still on Charlanon, puts us on a blue-graded run which takes us through startlingly beautiful scenery down to the Liaison cable-car linking the Brévent area with that of Flégère. Once safely across the void we’re skiing for just a few seconds before joining the Evettes chairlift for a smooth haul through the tree-line and up all the way to the base of the muscular Index six-seater chair (1892m). For reasons not immediately obvious Index is resolutely closed to skiers when we arrive. It’s a blow, since this key lift heads all the way up to 2405m for a choice of red- and black-graded descents (with a little help from the topmost Floria draglift), all with some pretty incredible views to the distinctive slender peaks on the opposite side of the steep-sided valley. Hopefully it’ll be accessible next time we’re here. Not that it’s all harcore stuff; if something a little gentler is more your style, just a short distance up ahead lie a couple of chairlifts serving mostly blue- and green-graded pistes (a welcome sight for post-debutants based down in Les Praz). Wooded pistes between Brévent and Flégère sectors. The snack-bar at the top of the Flégère cable car. It’s just above this exposed spot that we discover that not only the Index chairlift but also the Flégère cable car bringing skiers up from the valley floor are closed, and we’re about to find out why. At any other time we’d have passed by the slightly unappealing-looking Tendance Foehn snackbar/takeaway but high winds are now starting to whip up the snow and firing it at our faces like needles, so it doesn’t take long to decide to dive in for quick chocolat-chauds and let the storm blow through before we think of heading back over to the less-exposed Brévent sector. This looks like it could be a wild one. It can happen here, sending skiers further down the valley to the more sheltered, tree-lined pistes of Les Houches. Right now that has definite appeal. Happily, after stepping back out into the wind-chill and pointed our skis back towards the cable-car, we’re amazed to find that the return run on the blue-graded Évettes turns out to be quite literally a breeze, since it’s reassuringly sheltered, to the point where we wouldn’t have believed how conditions could differ so dramatically in adjoining areas. It also illustrates why it pays to keep a watchful eye on forecast conditions (and lift closures) around the valley when deciding where to head for your day’s skiing from Chamonix. 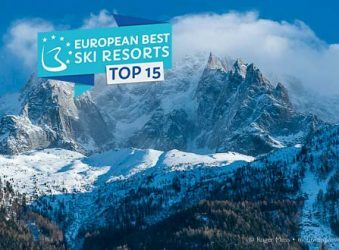 See our individual Resort Review pages for Argentière, Les Houches and Vallorcine & Balme ski areas in the Chamonix Valley.